Gustavo Dudamel's Mahler Ninth and Seventh. 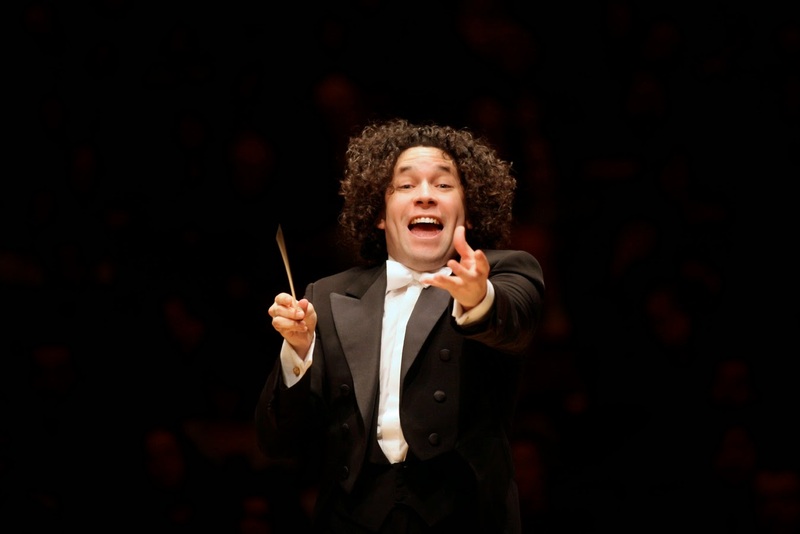 Gustavo Dudamel. Photo by Chris Lee. In today's dwindling music industry, symphony recordings are becoming more and more infrequent. This makes the Deutsche Grammophon release of new recordings of Gustav Mahler's Symphony No. 7 and Symphony No. 9 important documents in charting the development of a young conductor. These two releases (both were recorded in 2012) under the baton of Gustavo Dudamel feature the Simon Bolivar Symphony Orchestra (in the Seventh) and the Los Angeles Philharmonic (in the Ninth the two orchestras where Mr. Dudamel occupies the post of Artistic Director. The son of a trombonist and the leading progeny of the Venezuelan state music program El Sistema, Mr. Dudamel is just 34. He stands at the vanguard of a youth movement on orchestra podiums around the globe. In another era, conductors would not even contemplate a post at the helm of two major orchestras (on two different continents, no less!) at that age, let alone be halfway to completing a cycle of recorded Mahler symphonies. But times have changed, and these recordings allows the listener to experience valuable snapshots of this young maestro at work and examination of his two crucial artistic partnerships. The Symphony No. 9 is Mahler's final completed work, and the composer did not live to conduct, hear or revise it. Mr. Dudamel and his Los Angeles forces (recorded live at the Philharmonic's home in L.A.'s Walt Disney Concert Hall) take a disciplined and straightforward view of the score. Conducting the Mahler Ninth is all about dynamic control, especially in the slow final Adagio. This is one of Mahler's largest and most memorable constructs, taking the form of a long and gradual diminuendo stretched out to twenty minutes. Mr. Dudamel maintains that control as the music gradually loses its force. The tempos slow imperceptibly as the instrumental group thins, until just the violins are playing. Then, the final fadeout, presented here in crystalline sound, with the orchestra growing fainter...and fainter...and...silence. Mr. Dudamel and the Orquesta Sinfónica Simón Bolívar take a bold, energetic approach to this score, taking its slippery time changes and ringing peals of brass, woodwind and even cowbells purely at their face musical value. In this invigorating performance (recorded in the Sala Simón Bolivar at the National Center for Social Action Through Music in Caracas) conductor and orchestra charged headlong into the massive opening Allegro risoluto, built around that rarest of orchestral brass instruments, the tenor horn. The long three-movement intermezzo (two slow movements each marked Nachtmusik, flank a ghostly dance movement marked Schattenhaft) has a surreal, dream-like quality, thanks to Mr. Dudamel's preference for swift tempos in the second movement and crisp rhythms in the spectral scherzo. A little more impressionist color in the Andante amoroso (the fourth movement) would have been welcome, but the blazing, sun-drenched final Rondo is pure bright-burning courage. Mr. Dudamel's well-disciplined Venezuelan forces handle the brisk rhythms and bewildering time changes of this final movement, creating a festive and bustling atmosphere that leaves the listener invigorated.